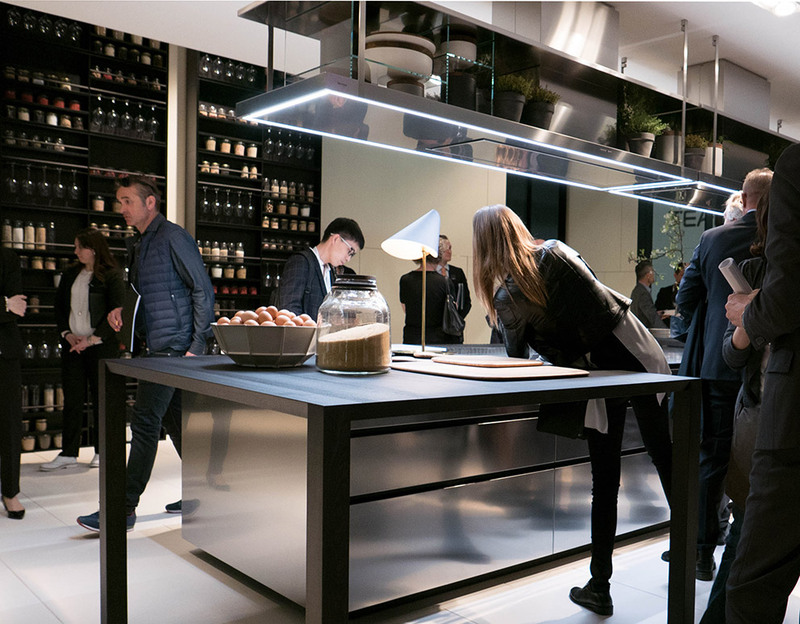 Kitchen year in Milan: At the trade fair and in the Fuori downtown, novelties are being set up. Few other projects are as complex and expansive as kitchens. Moreover, they belong to different spheres, in fact almost count as architecture, the details are often design, and on occasion the items are ingenious structures. More than in the world of furniture, here brand statements, image transfer and promised utility are mixed up in almost inextricable fashion. In kitchen year 2016 the term novelty is certainly relative. We can discern a trend to subject established model names to a facelift or model change almost as casually as happens in the auto industry. “We have four new kitchens!” one manufacturer announces euphorically. In fact, it is all about new tops and materials, simply reconfigured or newly arranged. Expanded possible combinations and improved fittings, often developed together with the component suppliers, are what is being called new. But the ploy works. Because everything that can be seen and felt constitutes the initial impression, and many kitchens set out to appeal at first sight. Although the industry thrives on the fact that kitchens age in designed and technical terms and need to be replaced now and again, at least the upper luxury segment champions materials that suggest they have the gleam of eternal durability. What long since also applies here is that “what you see is not what you get.” While at the “Mudec” museum the exhibition entitled “Sempering” by Cino Zucchi and Luisa Collinia celebrates processes and patterns that take their cue from Gottfried Semper and explore his impact on contemporary architecture and design, today Semper’s idea that a design must be appropriate to the materials has been revised. Semper once wrote that “the material itself speaks and is present, undisguised, in the conditions that experience and the sciences have shown to be most purposive for it.” That still holds. But his insistence that “brick should appear as brick, wood as wood, iron as iron, each according to its own load-bearing laws,” is no longer applicable in today’s world of kitchen manufacturers and designers. Quartz and HPL panels as well as other composite allow the structure to be separate from the decor. The change in veneers and forms of surface treatment creates a change in look. This enables ever new combinations to be tried out. Monumental interiors: Tom Dixon staged “The Restaurant” for Caesarstone. Kitchen, the designer declares, are all too often stood up against a wall. Manufacturers of the relevant materials have thus traditionally played a major role specifically in the Forum events. 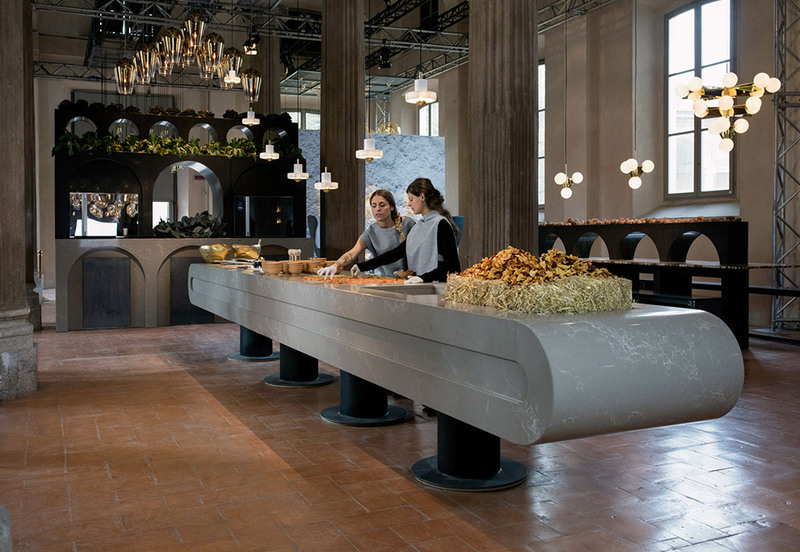 Especially spectacular: “The Restaurant” by Tom Dixon for Caesarstone, staged in the Rotonda della Besana. The event, which was devoted to eating and drinking together (with a comparatively inexpensive menu) revolved around four concept kitchens on the four elements, designed by Dixon. But this was no contribution to advancing kitchens. These are monumental shapes with maxed showy-ness as a response to the space. By comparison, Sapienstone was innovative. 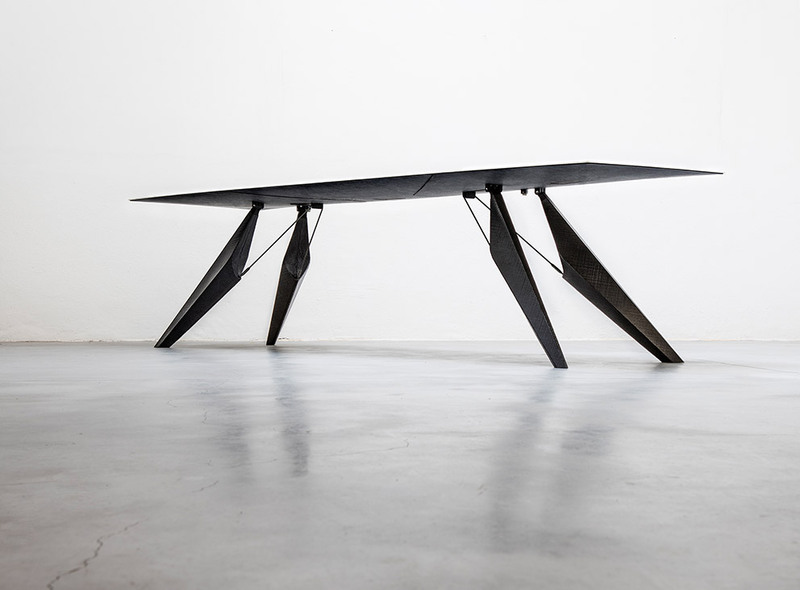 Reed Kram and Clemens Weisshaar designed the “Smartslab Table”, which went on display in the public experimental lab at Palazzo Clerici. The duo combined an extremely durable material for the tops with a Touch Interface. 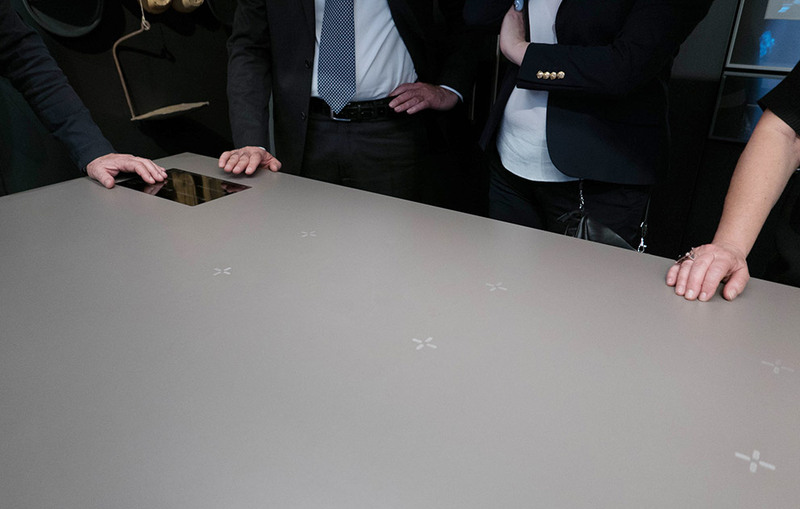 They also gave the table a flat electronic substructure enabling induction cooking. Moreover, keep-warm zones with ideal temperatures keep your plates warm at table. Bottles of wine or mineral water are cooled. The functions can be regulated by touching the surface. The “Smartslab”, of which there were many in the Palazzo, is a table with additional electronic functions or, if you so will, a compact occasional kitchen, whereby the height of the worktop is simply the seating height at table. Solid wood meets stone: Team 7 presents kitchens in changed combinations of materials, such as “Vao” by Sebastian Desch. What Karim Rashid has come up with for Rational seems comparatively simple by contrast: A kitchen made of Corian steel that is called “floo”. Its unmistakable touch: the end-to-end handle that bulges outwards. How unfortunate that all those damp and fluid things that invariably arise when you’re preparing and cooking meals will drip down precisely between the top and the handle. Or you simply don’t bother using this kitchen all in white for preparing anything and that way it remains inapproachably pristine. Cooking. That once was. Or not? Team 7 has strongly revised some of its kitchens. As early as January the new “Linee” kitchen went on show in Cologne, and now in Milan it’s on display in different versions combined with white and black fronts. 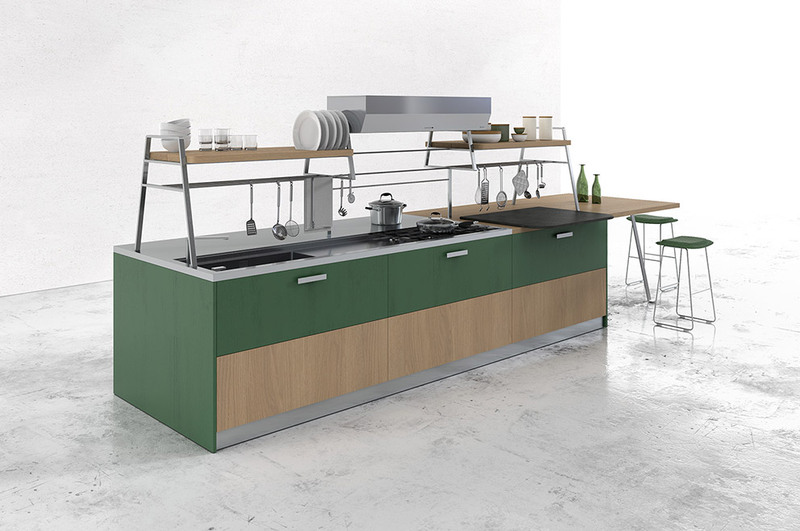 All in all, the Austrians show that they can not only process the solid wood which is always on the inside, but also master countless other materials when it comes to applying and realizing the right, fitting kitchen recipes. A few steps on, at Varenna, it is likewise materials and surfaces that have been changed. The company is committed, so it says, to produce for an ever more discerning international market. The latest versions and configurations boast paneled fronts, high-gloss dark surfaces and the generous use of steel. 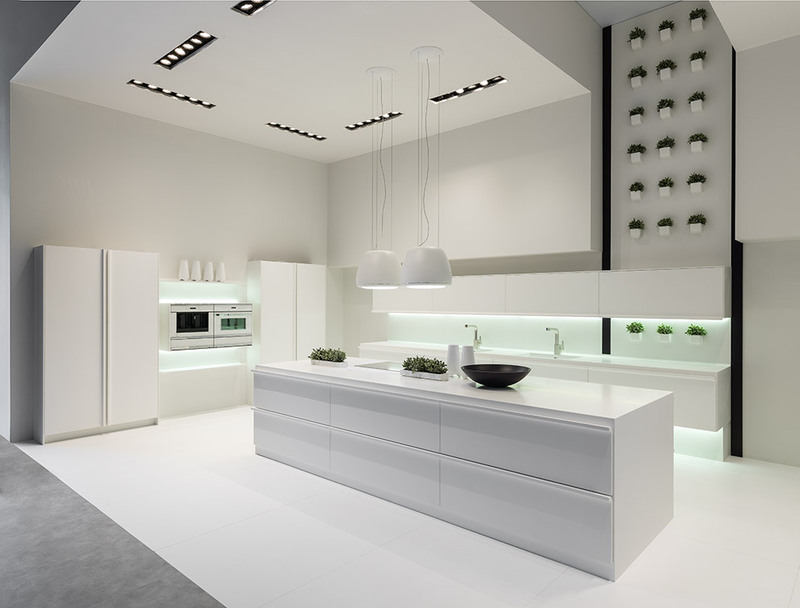 As everywhere, LED light elements are noticeably the rage, duly highlighting cupboards, walls and worktops. At Dada, Vincent Van Duysen, the new Creative Director at Molteni and Dada, has revised the “Hi-Line” model. Here, too, the emphasis is on a changed combination of materials and colors. 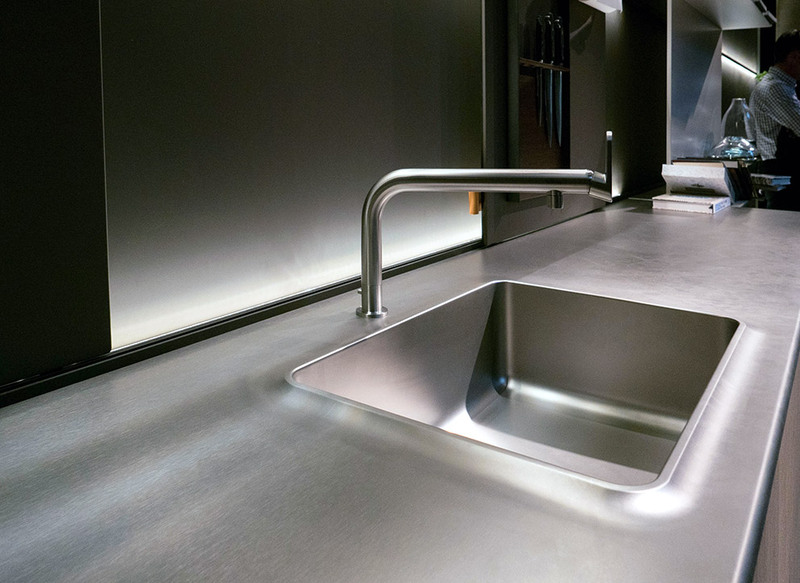 Steel does not have to gleam everywhere, as the new “Rustico” versions seem to be easier to clean and are already in use in many places. Basin in front of the stage: Kindling your curiosity as to what exactly is behind the details that the Bulthaup design team has dreamed up. The table as the starting point: Bulthaup’s staging revolves around seating as the meeting point, whence you can gave around the room. 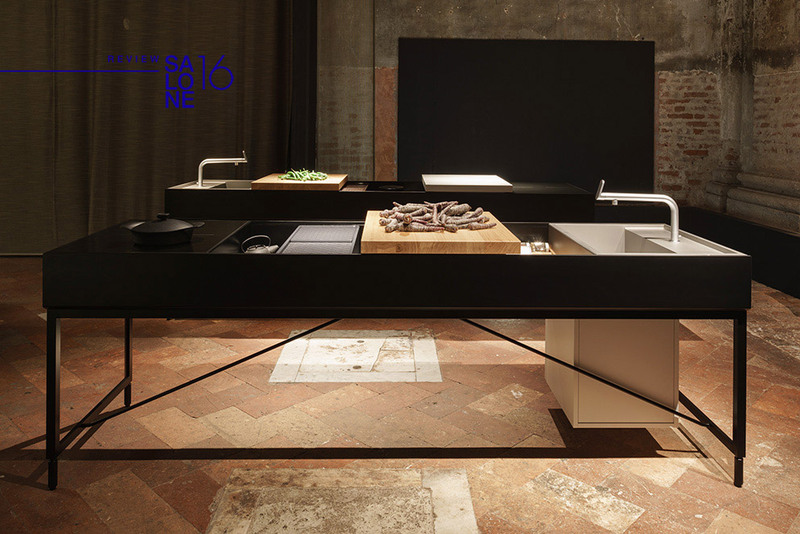 In Milan, profane kitchens are the new altars to which the design community flocks like pilgrims. San Carpoforo in the Brera district has since 1864 been part of the City of Milan, which assigned it to the Pinacoteca di Brera for the latter to use as it wished. Inside, the building is so very dilapidated that Bulthaup, which rented it as its events venue, largely covered over the historical edifice in order to be able to present new products without the danger of bits of the building falling on them. The products are definitely worth the effort. The “b3” system was originally conceived such as to ensure that starting from the kitchen the entire house be infused with a sense of system and subjugated to a clear structural order. And it is now displayed in a far more atmospheric vein in the “Milano 2016” version, which boasts countless new details. What catches the eye are the detailed gas hob and the stainless steel or stone wash basin with its fine radii. There are wall panels (no called “Bulthaup Wall”) covered with Japan paper and illuminated by concealed LEDs. Bulthaup says that it is the angle of vision of the seated person that structures the wall. 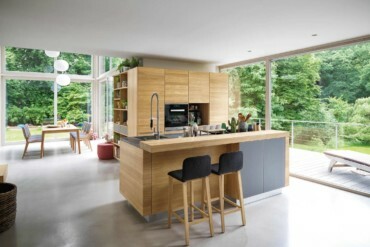 It is conceptually and spatially sub-divided into a “working line” and a “function line”, the former level with the work top, the latter the basis for countless optional panel sections that turn part of the room temporarily into the kitchen. 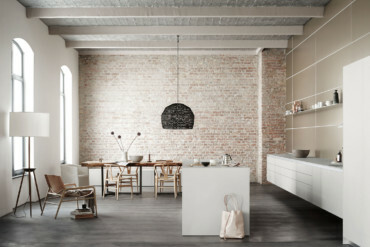 After use, all the utensils can be slid sideways to disappear back into the wall, thus bringing Bulthaup’s zest for order (see above) firmly to bear. The concept and the staging center on a long table where visitors, dealers, fans of the brand and many others all meet briefly, discuss things, or simply relax. The “b+ Solitäre” with its cruciform base has been expanded and now has a new meaning in life, for example as a compact “cooking table” which can be utilized by people sitting opposite simply by their turning dials. And the Bavarian-based company has brought along a new “b1 system”, a work bench with differentiated, mobile inner workings to Milan. The result: a new mixture of precise designs and machine-supported artisanship. And few other than Bulthaup really master it. Criticism? It is strange that all of this is attributable to the “Bulthaup Design Team”. No names of product designers are mentioned. 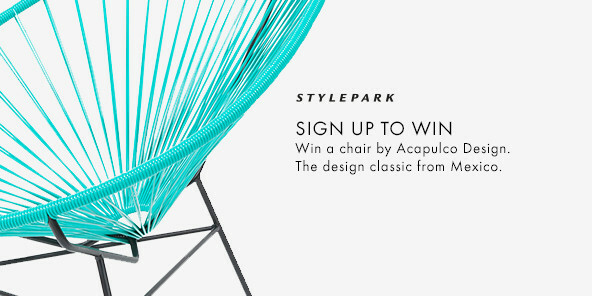 One could at least name those involved in the design process – without by so doing advocating celebrity designers. But that is just a detail. 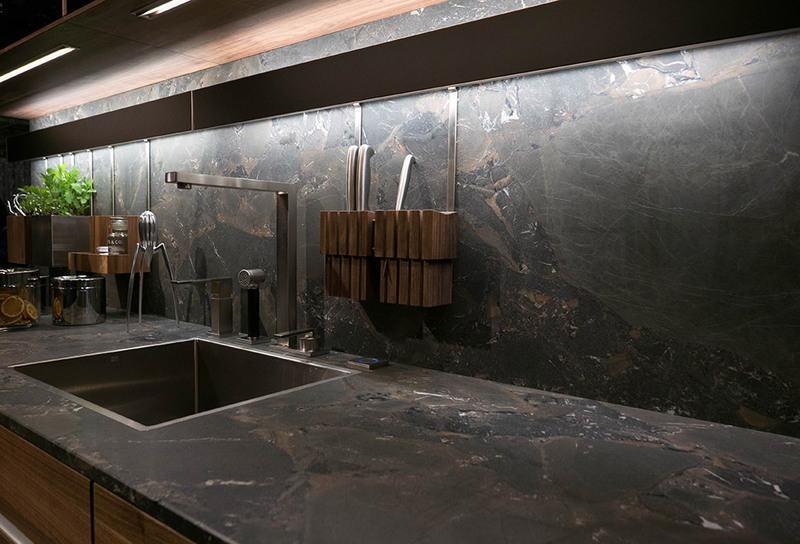 The surprises of the fair, or rather the Fuori, include two new kitchens that are not meant to address the highest end of the high-end and instead tussle with everyday issues of functionality and life in a big city. They are made for small apartments where people possibly sit down to eat in their kitchens. A realistic scenario. First, there’s the “KS Kitchen” that Giulio Cappellini and Alfonso Arosio have dreamed up for Del Tongo. It’s a company which in Italy tends to focus on the mass market and thus industrial production processes rather than artisan craftsmanship. 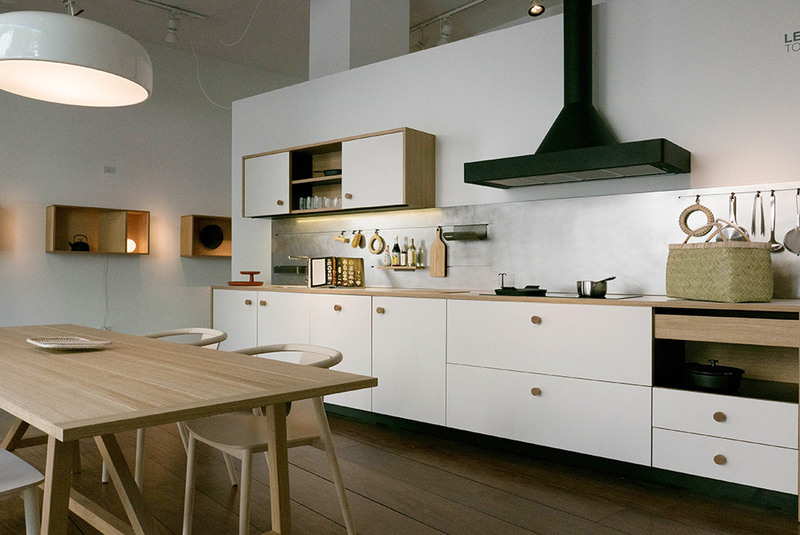 Arioso was for long the mind behind the Cappellini showrooms before becoming Head of Design for the kitchen brand. 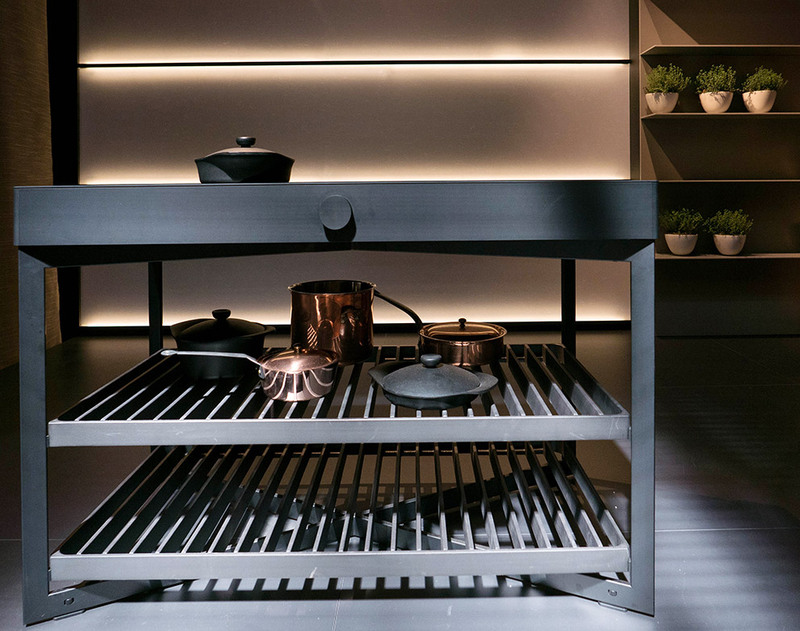 On display were the “Borghese”, a combination of straight-line and standalone kitchen, “Radicale”, a linear structure with compact attached eat-top, and “Laboratorio”, a long standalone with freely accessible compartments for kitchen appliances and utensils. There are tables and an open shelf system to round things out. Even more convincing: “Lepic”, which Cappellini’s friend Jasper Morrison created for Schiffini. Hard to imagine it is the Brit’s first kitchen design. It is on display in the showroom in three versions: “Stockholm”, “Paris” and “Tokyo” – which seems to echo the biography of Morrison’s design worlds. Not exactly easy on the manufacturers, but all the more beautiful would be the version with Douglas fir panels. Its fate has not yet been decided. “Lepic” is intended to be positioned above the basic Schiffini model, but below Alfredo Häberli’s “Pampa” model. Morrison has sparingly decorated the kitchens with his own designs – even including everyday objects from his shop. “Lepic” boasts many a clever detail that give the impression Maître Morrison was cooking for himself and his friends, staff and guests – or even himself. And is cooking not a kind of design process itself? Is design not an especially constant form of cooking? 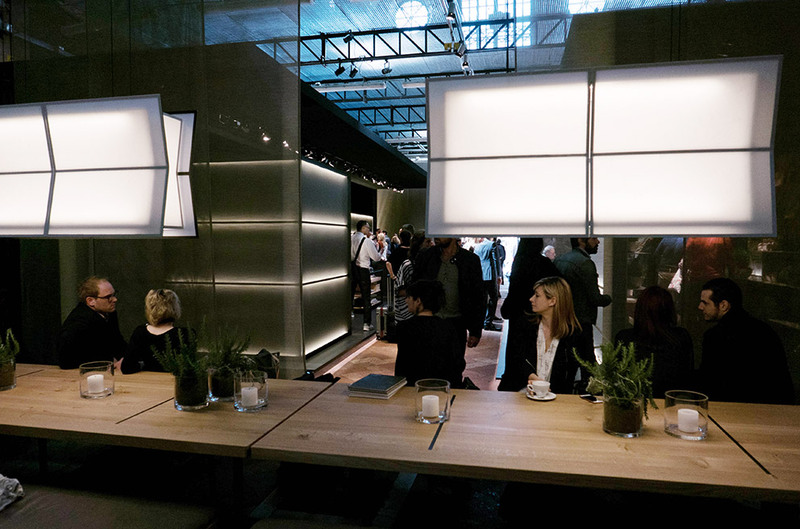 Milan 2016: Designers and manufacturers have prepared the ingredients. It remains to be seen what actually gets served, what kindles enthusiasm, and what gets bought.